Beats can be divided up in all sorts of ways. Here we are going to look at the ways we can split a beat into 4 parts. So the basic idea is this. Let’s say we’re using a simple time signature (4/4, 3/4, 2/4, 5/4 etc). We’re going to use 4/4 for this work to keep things simple and widely usable. In this case the beat will be a crotchet long (a quarter note as it is called in the US). We can count that beat by simply saying 1, 2, 3, 4. We can divide each beat into two parts. Each half a beat would be a quaver (eighth note) long. We would count that at 1 + 2 + 3 + 4 + . If we divide each quaver into two parts then we get four notes to each beat. Each quarter of a beat would be a semiquaver (a sixteenth note in the US). We would count that as 1 e + a 2 e + a 3 e + a 4 e + a . Here is a diagram showing these relationships. I’ve also shown how a rest will look for each note duration. 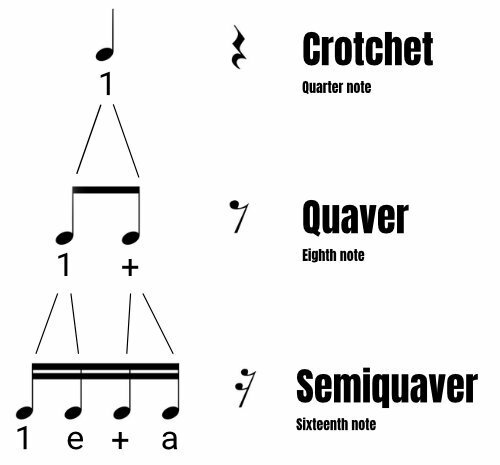 Here are all the useful semiquaver patterns below with an explanation of how they are made up, how to count them and how to strum them. This point cannot be over emphasised! Your hand must move up and down smoothly – that way even if you miss the notes when you meant to hit them you’ll still be in time. So what you’ll do is make the movement without hitting the strings. So for example in the first figure shown below you still go D U D U but you’ll miss the strings on the first U. Like this D (U) D U, where the brackets show that you still do the movement but you wont hit the strings. That way you won’t miss out the time that the ‘e’ denotes. When you count out loud you activate the parts of your brain that are going to be used to perform music – so the rate you learn at increases. When you speak the rhythm first you will ‘get the idea’ of the rhythm much quicker and then just transfer that idea to your hands (through the principle of plasticity of reflex). This first little batch have a strum at the start of every beat – so they’re easier to get the feel of. Here you’ll strum on every semiquaver. If I join the first two semiquavers back up again they’ll form a quaver. So I’ll miss the strings for the 2nd semiquaver – the ‘e’. Here we’re joining the last two back up. We’ll miss the strings on the ‘a’. Here’s the middle two joined up. Miss the strings on the ‘+’. here the first three semiquaver beats are joined up to form a dotted quaver. Now the last three semiquavers are joined up to form a dotted quaver. In these figures you have to miss the strings on the start of each beat. So whichever number you’re saying (the number of the beat) say the number, do the down stroke, but don’t hit the strings. Here you’ll strum on every semiquaver except the first one. Now miss on the beat and again on the ‘a’. This time you have to miss on both the down strokes. In these figures you have to miss the strings on the start of each beat. So whichever number you’re saying (the number of the beat) say the number, do the down stroke, but don’t hit the strings. There are other ways of showing these patterns if you vary the duration. For example when you just hit the strings on ‘1’ you could hold that chord for the whole beat, so you would show that as a single crotchet (quarter note). But here we’re trying to develop constant movement of the strumming hand. That will happen better when you’re thinking about every semiquaver. So here are the patterns using some unconventional notation for clarity’s sake. Event though you are going to only hit the strings once in each beat you must make the movement and miss the strings on all other parts of the beat. Miss on everything except ‘1’. This is really simple. Just hit the strings on the beat. Keep your hand moving though, just miss the strings on the other three parts of the beat. Miss on everything except ‘+’. Just hit the strings on the ‘+’. Keep your hand moving though, just miss the strings on the other three parts of the beat. Miss on everything except ‘e’. Just hit the strings on the ‘e’. Keep your hand moving though, just miss the strings on the other three parts of the beat. Miss on everything except ‘a’. Just hit the strings on the ‘a’. Keep your hand moving though, just miss the strings on the other three parts of the beat.